Completed magnificent stupa in Thame, Nepal. Lama Zopa Rinpoche was born in the Mount Everest region of Thame, located close to Lawudo which was the home of his previous incarnation known as the Lawudo Lama. Many Kopan monks are also from Thame. During the earthquake of 2015, the Thame region was seriously affected. Almost all the homes in the area were damaged or completely destroyed and several people died. Only a few houses remained standing. Amidst the destruction, a large stupa was destroyed. 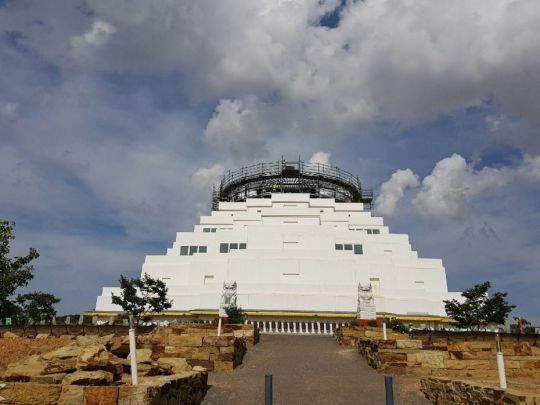 The new stupa, which stands nearly 46 feet tall with a base measuring 54 feet across, is larger than the one which previously stood and is utilizing much of the materials from the original stupa. This magnificent stupa also features a large prayer wheel inside, pilgrims and locals can enter the stupa to spin it and create even more merit. Rebuilding this stupa was a tremendous undertaking with many obstacles and hardships along the way to completion including the utilization of helicopters to deliver supplies and mantras. Please join us in rejoicing in the effort of every person who worked on the stupa in any way, and specifically Ven. Tenpa Choden who managed the entire project. 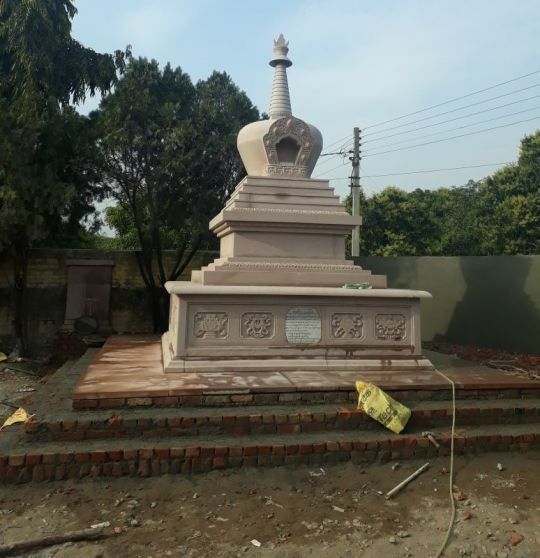 The previous Thame stupa was destroyed in the 2015 earthquake. Lama Zopa Rinpoche, through the Stupa Fund, has offered over US$300,000 for the rebuilding of the stupa which took two years to complete. Please take a minute to enjoy these videos which show various aspects of this incredible holy object project. Lama Zopa Rinpoche translated Padmasambhava’s Instructions on Offering to Stupas which explains numerous benefits of prostrating to, circumambulating, making offerings to, and offering service to, stupas. Gyumed Khensur Rinpoche Lobsang Jampa blessing the prayer wheel site at Vajrapani Institute. 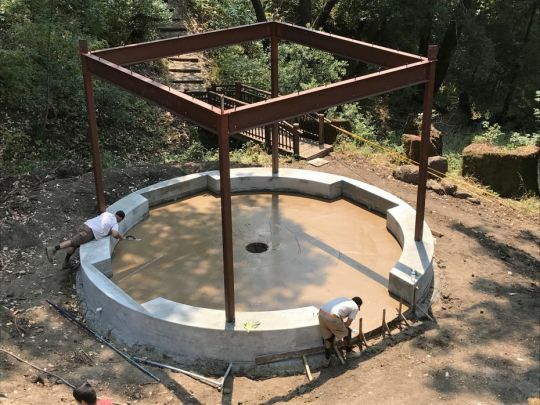 Vajrapani Insititute, an FPMT retreat center in Northern California, is now well on its way to building the Prayer Wheel of Compassion which was announced in December 2016. The 10 ft x 7 ft prayer wheel will contain 5 trillion (5,000,000,000,000) copies of OM MANI PADME HUM, the mantra of Chenrezig, the Buddhist deity who embodies universal compassion—a request that came from Lama Zopa Rinpoche. The first phase of this ambitious project reached completion over the Summer months in California including all of the planning, completion of initial designs, and securing required permits. The prayer wheel foundation with concrete finish work and steel structure. 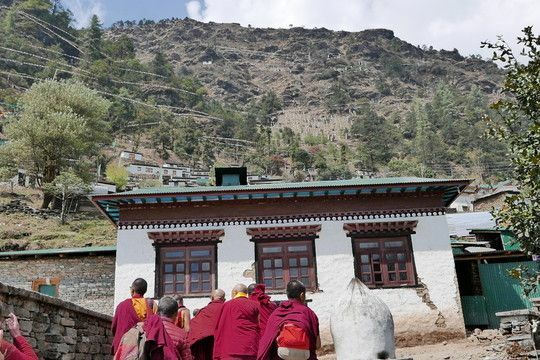 The second phase of the project, slated to begin in January 2019, includes framing out the rest of the structure, installing copper roofing and bearings, structurally rebuilding the frame, and the erection of the prayer wheel which will be filled with 250 billion mani mantras to start. At this point the traditional ornate wood-carved artwork that will adorn the structure will also be made. 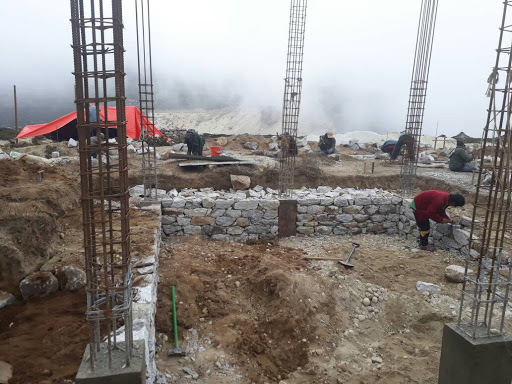 To reach the 5 trillion mantras, Vajrapani Institute will gradually raise all of the funds required and build the structure in a way that will be able to hold the weight (estimated at 18,000 lbs) and spin easily. 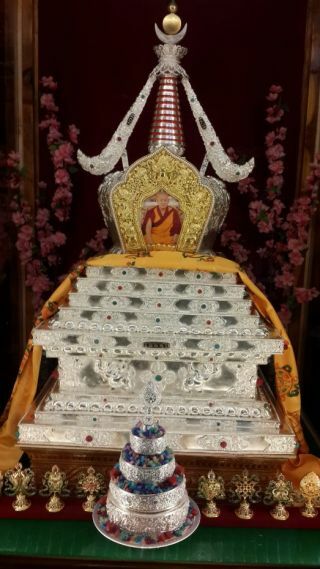 Lama Zopa Rinpoche, through the Holy Objects Fund, joined other generous donors and offered US$20,000 and has pledged an additional US$20,000 toward the construction of this incredible holy object. 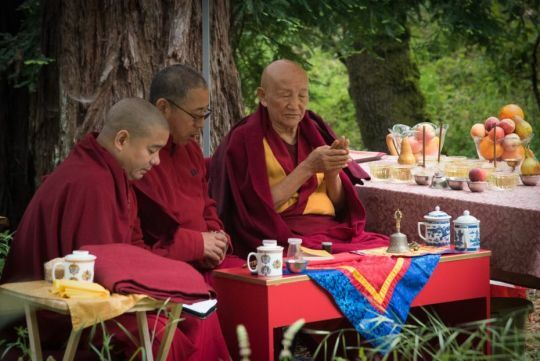 Rinpoche has explained that every time you rejoice in an offering, the construction of the prayer wheel, and in the effort of all those who are working to actualize it, the merit doubles. When you rejoice the second time, the merit is multiplied by four. The third time, it is multiplied by eight. It is amazing! 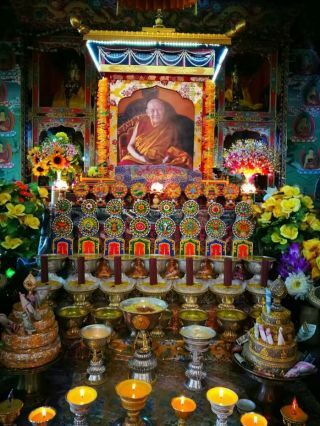 Lama Tsongkhapa said that to collect merit, the best way is through rejoicing. You can watch a short video on this project which outlines some of the many benefits of the completed prayer wheel. To help ensure grants like this continue toward holy objects, all are welcome to offer a donation of any amount to the Holy Object Fund. Jangchup Stupa project in progress at Shalu Monastery. Shalu Monastery was founded by Chetsun Shetsun Jugney in 1027 A.D at Shalu Village near Shigatse town in Tibet and was consecrated by Atisha. The number of the monks studying there reached 7,700 at the peak of its opulence. During the Chinese invasion of 1959, this precious monastery was destroyed. It was re-established at Tibetan Cholsum Settlement, Bhuppur, India, and was consecrated by Sakya Trichen Rinpoche in March 2005. Currently there are 30 monks practicing and studying at this monastery. 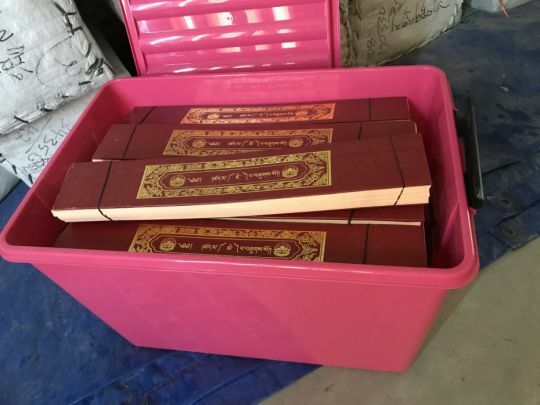 The Holy Objects Fund recently issued a grant for the building of a 15 ft x 11 ft Jangchub Stupa which will be surrounded by prayer wheels that the resident monks and visitors can utilize for circumambulation. Lama Zopa Rinpoche arriving at Trulshik Rinpoche’s monastery, Thubten Choling, March 2018. Altar for Trulshik Rinpoche at Thubten Choling monastery. Thubten Chöling is a large monastery built by the late Trulshik Rinpoche in the 1960s in Solu Khumbu near Chailsa, Nepal. One of the greatest living masters of the Nyingma and rime traditions of Tibetan Buddhism, Trulshik Rinpoche, who passed away in 2011, was one of Lama Zopa Rinpoche’s gurus. Trulshik Rinpoche was the closest and most realized disciple of the late master, Dilgo Khyentse Rinpoche. It was prophesied in Khyentse Rinpoche’s visionary teachings (terma) that Trulshik Rinpoche would be the spiritual heir to his teachings, and in his absence, Khyentse Rinpoche referred all important matters to Trulshik Rinpoche. Upon Khyentse Rinpoche’s passing in 1991, Trulshik Rinpoche was entrusted to find his reincarnation. He also visited the west several times to give teachings to students. Rinpoche with Thubten Rigsel Rinpoche and the incarnation of Trulshik Rinpoche during Guru Rinpoche bumtsog. 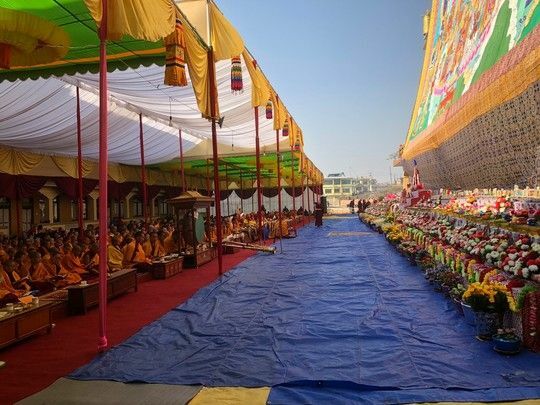 In December of 2017, Khachoe Ghakyil Ling in Nepal hosted a 100,000 tsog offerings for Guru Rinpoche in front of the gigantic Guru Rinpoche (Padmasambhava) thangka. 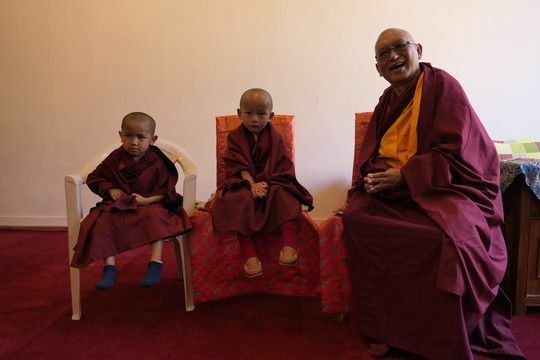 Lama Zopa Rinpoche attended the special puja, known as a “Guru Rinpoche bumtsog,” along with the young incarnation of Trulshik Rinpoche. Lama Zopa Rinpoche offering a khata to the holy body of Trulshik Rinpoche at Thubten Choling Monastery, March 2017. In March 2017 Rinpoche visited Thubten Chöling to pay his respects to Trulshik Rinpoche’s holy body which was in a mandala house above the altar at the monastery. 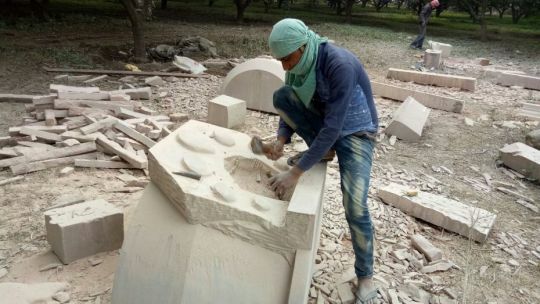 While there Rinpoche offered to sponsor half the costs of a stupa being constructed there which will ultimately house the body of Trulshik Rinpoche. Please rejoice that this most precious stupa is being built contributing directly to more peace and merit for sentient beings on earth. 100,000 Tsog Offering to the giant Padmasambhava thangka at Kopan Nunnery. 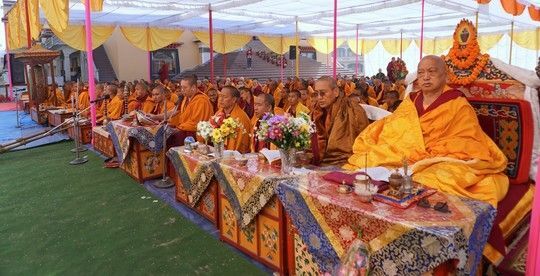 Lama Zopa Rinpoche and other Sangha offering 100,000 tsog offerings to the giant Padmasambhava thangka at Kopan Nunnery. 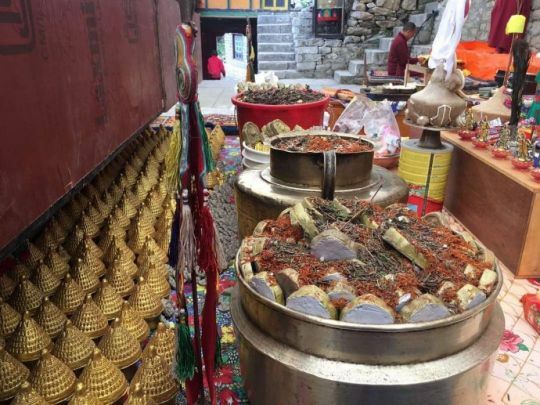 In addition to statues, the Padmasambhava Peace Project sponsors 100,000 tsog offerings to Padmasambhava. In 2017 sponsorship was provided for two 100,000 tsog offerings at Kopan Nunnery, Nepal. 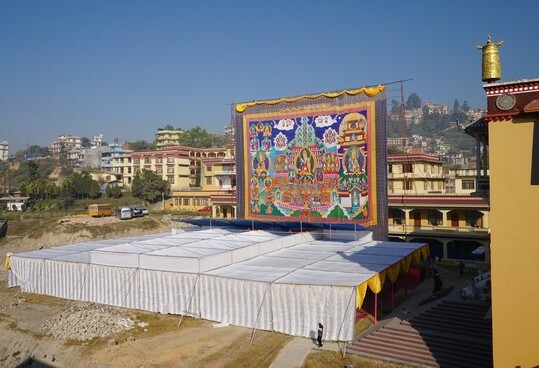 The incredible 75 feet high x 87 feet wide thangka of Padmasambhava which resides at the nunnery was raised for the occasion. Lama Zopa Rinpoche and over 1,000 Sangha came to each puja to offer these prayers and offerings were made to all who participated. 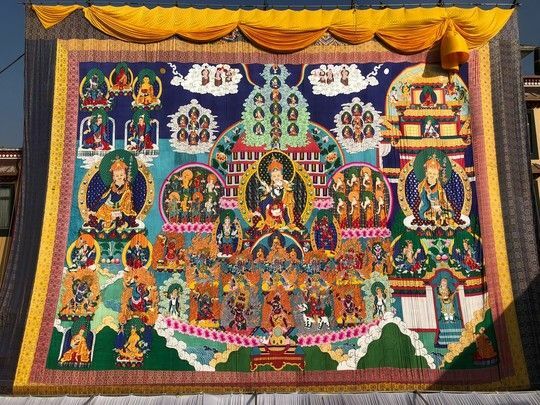 One of Lama Zopa Rinpoche’s Vast Visions for FPMT is for centers to have large thangkas and organize festival days around their display. 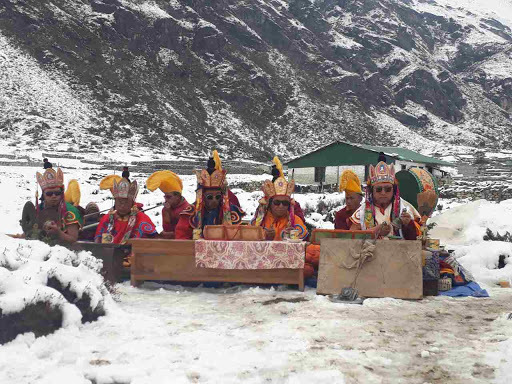 Offering to Padmasambhava in this way is a powerful way to create the causes for world peace. You can learn more about all the holy object projects for world peace supported by FPMT Charitable Projects and donate any amount so that offerings such as this can continue. 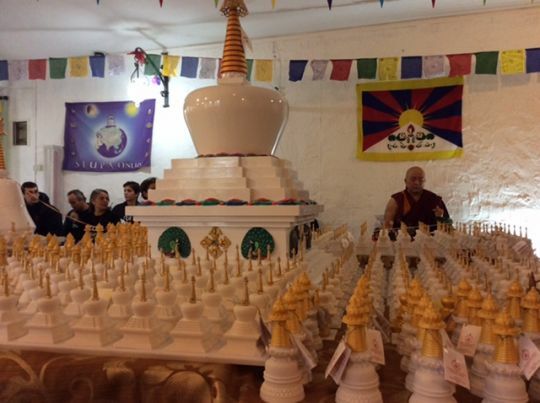 The whole community has come together to rebuild the large stupa in Thame. 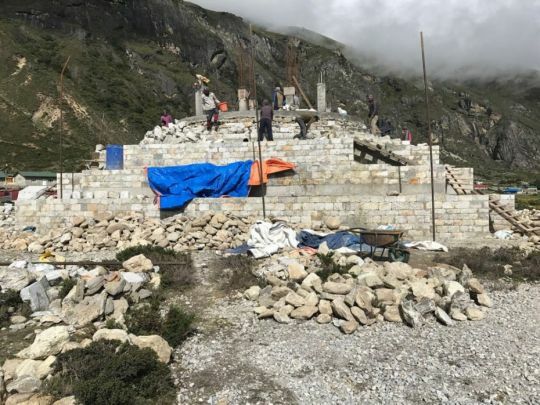 Recently, a grant was offered toward a large stupa being built in Thame in the Solo Khumbu district of Nepal to replace one that was destroyed in the 2015 earthquake. The new stupa, which will stand nearly 44 feet tall with a base measuring 56 feet across, will be larger than the one which previously stood on the site and is utilizing all the materials from the original stupa. 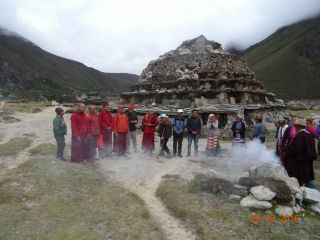 Many villagers helped over a two day period to move the stones of the destroyed stupa to the new one. A wonderful collaborative effort. All of the materials from the destroyed Thame stupa were utilized in the rebuilding of the new one. Lama Zopa Rinpoche was born in the Mount Everest region of Thame, located very close to Lawudo which was the home of his previous incarnation known as the Lawudo Lama. Many Kopan monks are from Thame including one of Lama Zopa Rinpoche’s attendants, Ven. Tendar. 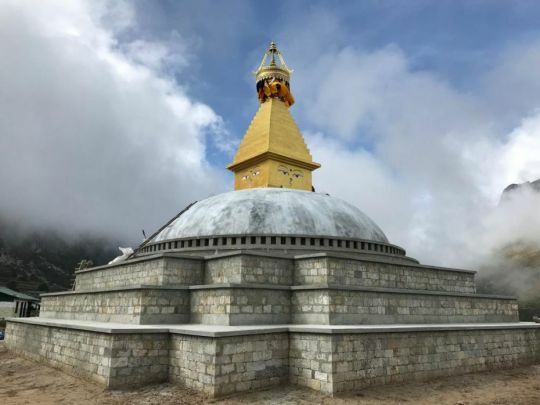 The Stupa Fund has thus far offered a total of US$249,071 toward the completion of this stupa and another disbursement of funds will occur as the project progresses. Progress on this stupa is due in large part to the kindness and effort of Ven. Tenpa Choden, Kopan Monastery’s manager, who is overseeing this entire project with such enthusiasm in order to actualize the stupa which is expected to be completed at the end of 2018. Scaffolding level 6 of the Great Stupa of Universal Compassion. Photo provided by Ian Green. The Great Stupa of Universal Compassion is an FPMT project near Bendigo, Australia which, once completed, will be the largest stupa in the Western world. The Great Stupa is the final home for the largest gem quality Jade Buddha in existence. Ven. Lobsang painting the arch inside the north end of the gompa within The Great Stupa. Photo provided by Ian Green. The Great Stupa will serve as a major domestic and international tourist attraction and is designed to last over a thousand years. 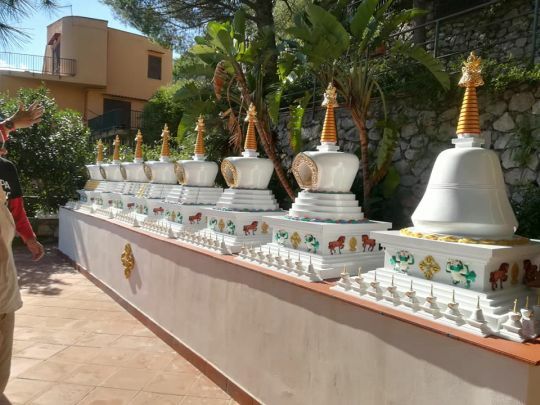 Due to the kindness of others, the Holy Objects Fund recently issued a grant to this impressive stupa project for the 28 ft x 6.5 ft umbrella which will contain embossed mantras advised by Lama Zopa Rinpoche. The umbrella will be handmade in Nepal out of copper and gold plated. This grant is also for the finalization of the first phase of construction which is projected to be completed in April 2019. According to chairman Ian Green there is still decades of work to be done before the stupa is entirely finished. After the first phase completion decorations will be added to each level and then work on the main gompa and eighty (approximate) shrine rooms will commence. Please rejoice in the progress of this truly inspiring holy object project. You can keep up on The Great Stupa’s progress and support its completion. 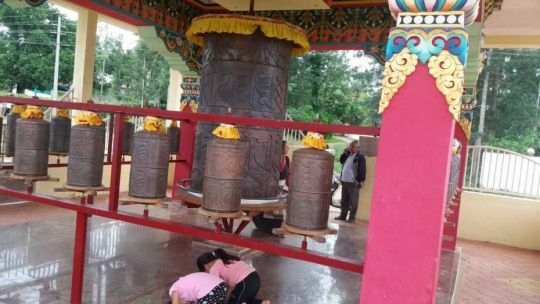 Large and smaller prayer wheels at a Tibetan settlement in Bylakuppe, South India, sponsored by the Holy Objects Fund. 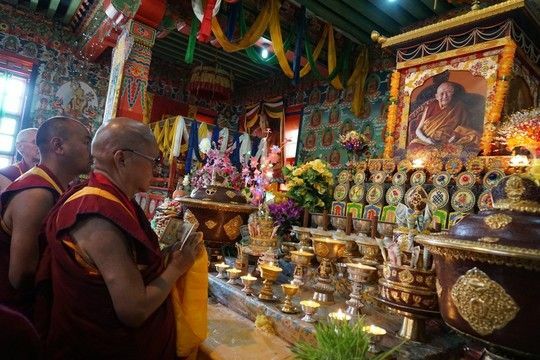 The Holy Objects Fund was pleased to donate US$5,262.71 toward the creation of a large prayer wheel and surrounding smaller wheels at Dickey Larsoe Tibetan Settlement, a Tibetan settlement in Bylakuppe, South India. The large prayer wheels contains 100,000,000 OM MANI PADME HUM mantras and nearly 400,000 are included in the smaller prayer wheels. 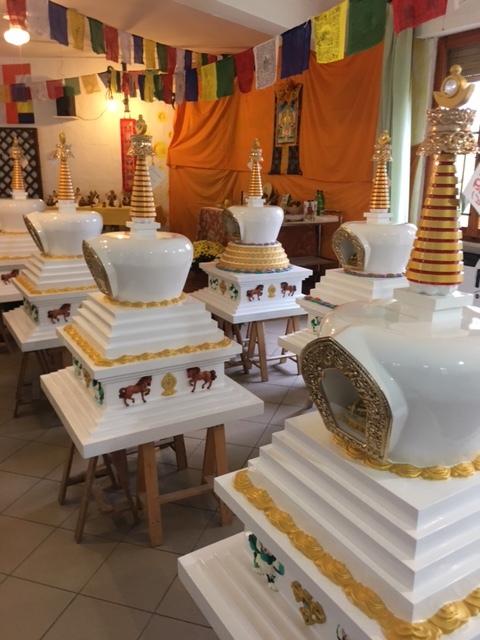 Please rejoice in the creation of these precious holy objects which bless all the residents of the Dickey Larsoe Tibetan Settlement and all who come in contact with the prayer wheels. Completed stupa for Geshe Gendun Choephel. Earlier this year we announced that a new stupa was being built at Sera Je Monastery for Tenzin Ösel Hita’s teacher, Khen Rinpoche Geshe Gendun Choephel, who passed away on July 31, 2016. 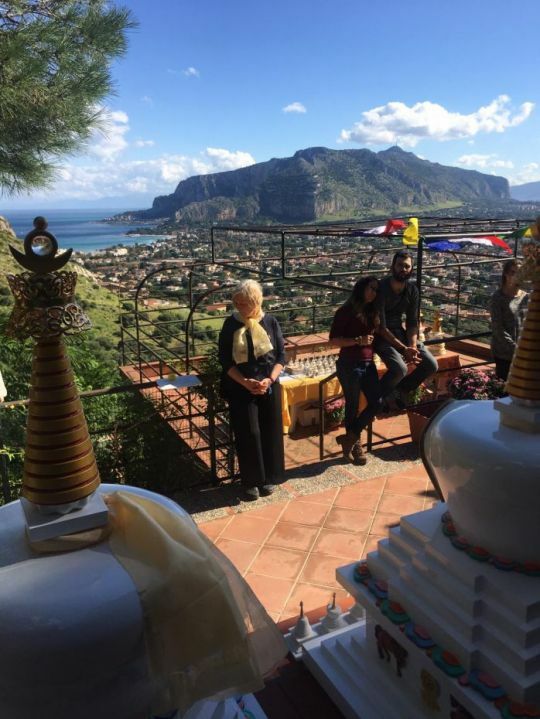 Ösel requested Lama Zopa Rinpoche to assist with this precious stupa, and Rinpoche, through the Stupa Fund, offered US$20,000 toward its completion. We are delighted to report that this special stupa is now complete. 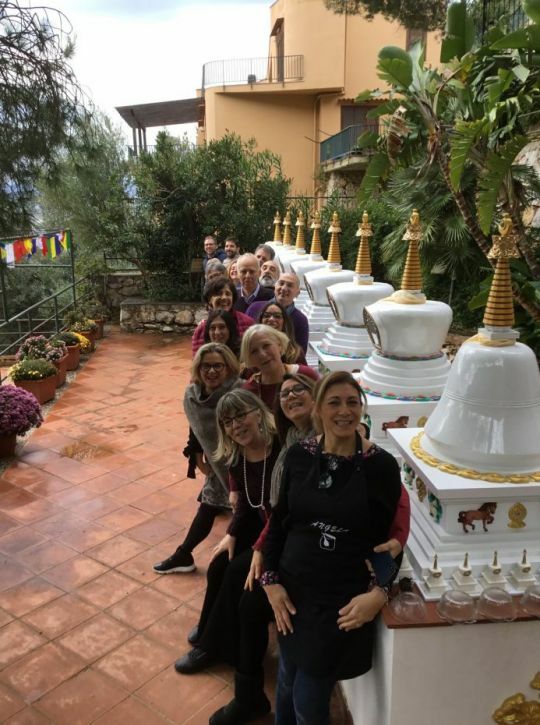 Please rejoice in the completion of this stupa for Geshe Gendun Choephel which brings so much benefit to his students, the world, and all sentient beings. A puja was offered on the site of the new large stupa in Thame, Solo Khumbu. 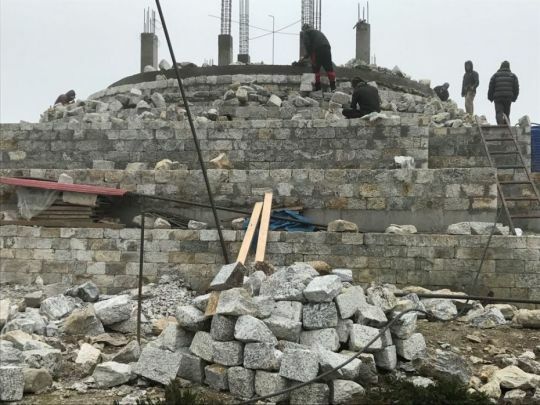 A large stupa is being built in Thame in the Solo Khumbu district of Nepal to replace one that was destroyed in the 2015 earthquake. The new stupa, which will stand nearly 44 feet tall with a base measuring 56 feet across, will be larger than the one which previously stood on the site. 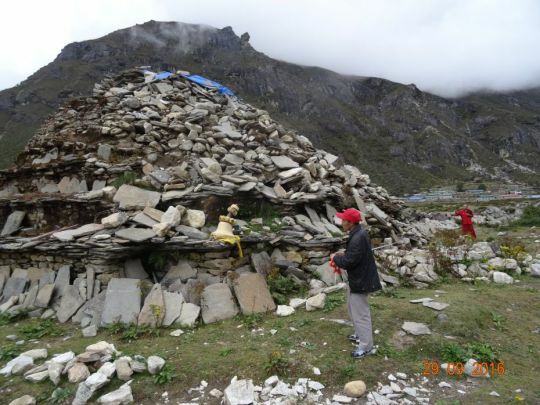 The site of the destroyed stupa in Thame, Solo Khumbu. “By building a stupa, without words we are continually liberating so many sentient beings. Every day, the stupa plants the seed of enlightenment and purifies anybody who sees, touches, remembers, talks or dreams about the stupa. This includes insects that touch the stupa. The stupa is meaningful to behold, and it liberates many sentient beings, insects and humans, every day. This stupa will be filled and consecrated according to instruction with holy objects and precious materials such as Dharma texts. The stupa will be filled with holy images and objects, mantras and the relics of holy beings. This new stupa project is being managed by Tenpa Choden from Kopan Monastery. The Holy Objects Fund was very pleased to offer US$100,000 toward this stupa which will have a final cost of approximately $US400,000. This very large and impressive stupa will bring ongoing benefit to all sentient beings who make contact with it. We look forward to providing more updates and details on this project as it progresses.